A Bay Area teacher friend drove to Brooks Institute this week for The Teachers’ Workshop. When I worked for Brooks, veteran high school photography teachers often shared stories about Brooks’ summer workshops in Santa Barbara. Teachers enjoyed meeting other high school teachers and the Brooks instructors. A few teachers recalled sailing with the founder Ernie Brooks off the Santa Barbara coast. 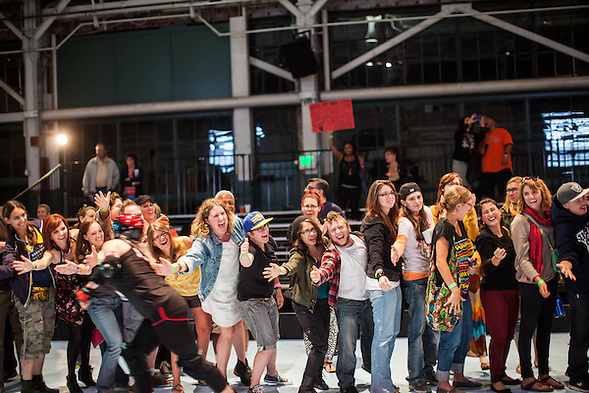 Across the country, teachers would ask about the summer Brooks workshop and our instructors. Teachers thanked me for the work of David Litschel one of the founders of the Photo Imaging Education Association. By the time I worked for Brooks, high school teachers had less contact with Brooks faculty and more contact with people like me. While I benefited, I knew that high school teachers would understand more about Brooks if the high school educators visited the campus and met our instructors, so I argued that the college reinstate the summer teacher workshop. It is easy for me to claim that I influenced Brooks’ decision to reinstate the summer workshop, because, on the internet, people can say anything… which is another reason that it is important for educators to visit the school. One lesson with a Brooks instructor can last a lifetime. I was lucky to have many lifetime lessons. So, what does this have to do with roller derby and Fiona Apple Sauce? If I had worked for a creative writing college, I might have met a writer who would have helped me overcome writer’s block and I could explain quickly. Instead, I met former Brooks Institute visual journalism instructor Paul Myers. Now I know how to take better pictures. (I still take forever to write.) Paul taught at Brooks for ten years. Paul’s lessons inform my photography nearly every day I shoot. 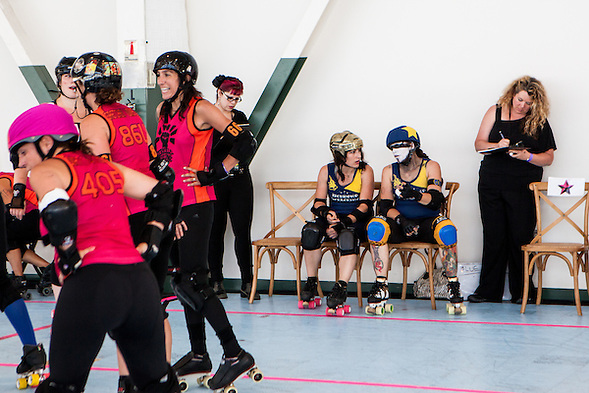 I often think about him when I find interesting light as I did last Saturday at the Craneway Pavilion in Richmond, California when I photographed two Bay Area Derby Girl bouts. 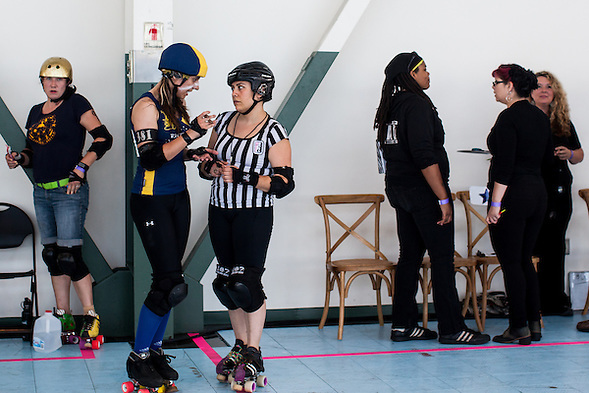 Photo Gallery of Bout 2 – Oakland Outlaws defeated San Francisco ShEvil Dead 206-200. During one of Paul’s presentations, he explained how he chases light. Paul said that he walks into a room and will just “Geek on light.” It was a verb. Paul geeked. He was not A GEEK. 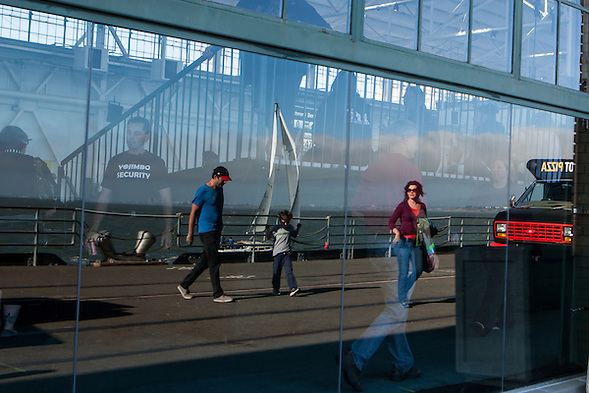 He would walk into every space and … space out. On light. When Paul described his method, geek sounded cooler than the way I type it with Bolds, and italics and other grammatical tricks. Paul was/is smooth. Paul also practiced viewing the world with a new perspective. He would intentionally chose a thing to photograph before going out to shoot street photography. For example, he would look for hands, and go out and make pictures that had something to do with hands. This lesson helps me overcame “shooters’ block.” Sometimes, I add colors, emotions and actions as if I am playing a comedy improvisation game. When I am at derby, I might add song lyrics, but only the masters can combine “Maserati,” “Burning Red” and “Love” (or “star,” “Golden” and “wish”). I am no master. 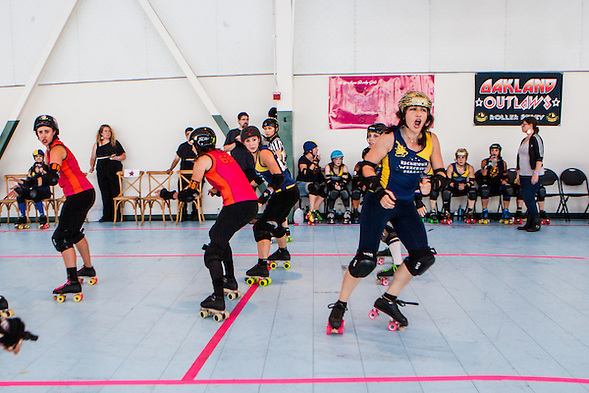 So about Fiona Apple Sauce (my apologies to any real derby player with this persona or Fiona Apple Cider, both perfectly good personas). 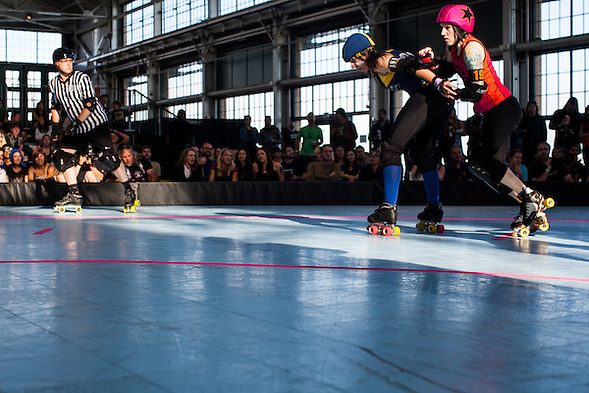 The Bay Area Derby Girls music man somehow always seems to play the perfect music when my heart is out of tune. I do not know his secret; he is “mysteriously rewarding.” Last weekend, he played something that reminded me of a nagging unanswered personal question. One upon a time, I asked an important life question. I had just finished surgery, so I might be mis-remembering. Was it just a dream? Anyway, my question must have been in the form of a musical request, because the response was more Pandora-fortune-cookie than useful advice. The answer: Fiona Apple’s Criminal, Shadowboxer and Sleep To Dream… in that order. I should have asked, “Can you give me three songs and an artist for derby photography inspiration?” I could have rolled with that. So I did, and last Saturday, I sang to myself even during the quietest moments. Derby is a great sport. 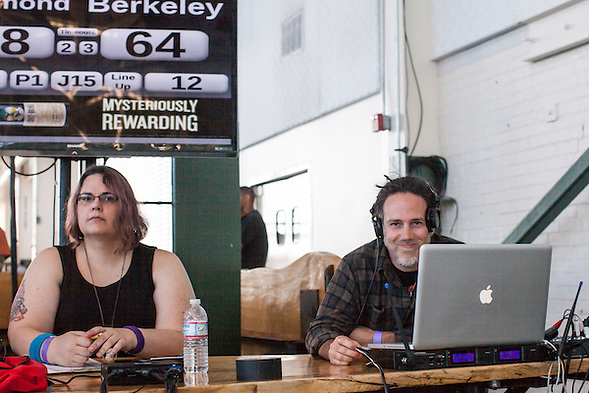 It is high scoring and everyone seems to have fun, and while it is not criminal, it is competitive. Much of the game is defensive. Players are often penalized. 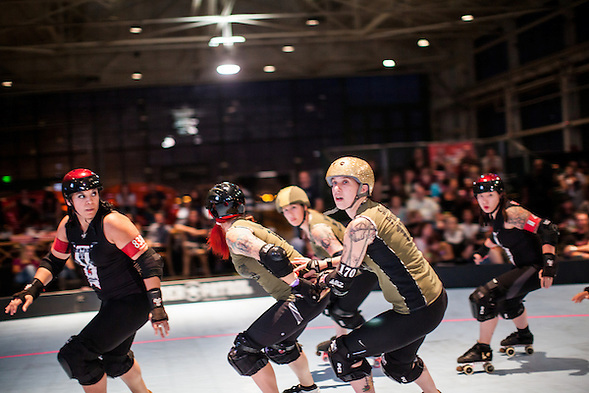 Most people respect each other most of the time, but derby is not a drum circle. I am pretty sure that even my mom has stopped reading now, but I am almost done… one more Shadowboxer photo. In the photo above, there are a few voices that will not be stifled. If you look through my two galleries from last weekend, you can see more unstifled voices. For the last photo, I selected Y.I. Otter. If you have not heard her voice, you are missing something special. Her voice is part ice cream sandwich and part another ice cream sandwich. This entry was posted on Saturday, July 20th, 2013 at 9:49 pm. 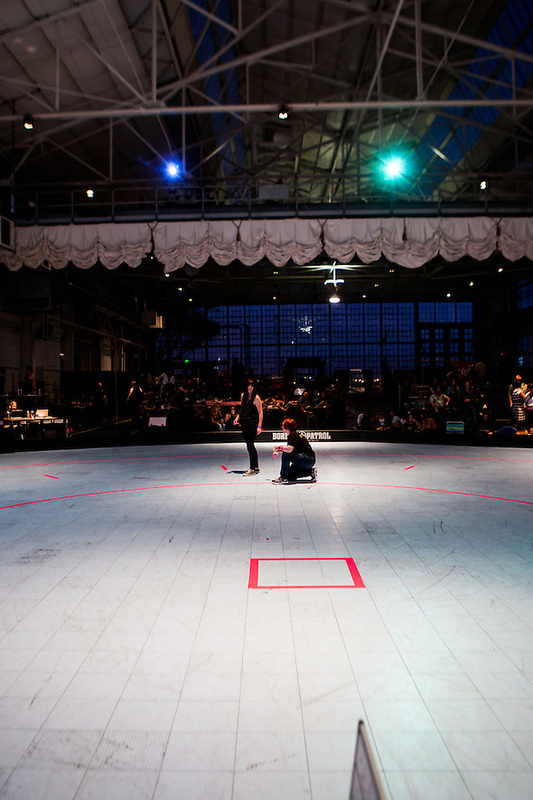 It is filed under Roller Derby and tagged with Bay Area Derby Girls, Women's Flat Track Roller Derby. You can follow any responses to this entry through the RSS 2.0 feed. Who did you know that went? I wonder if I met him/her! 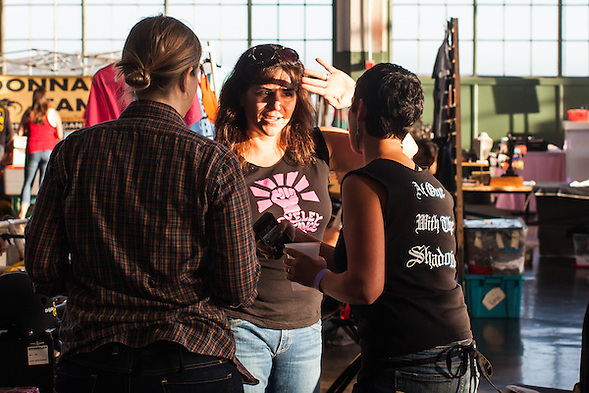 Did YOU go this summer to the workshop?